I hiked through Happy Canyon many years ago with a group from BYU. We were supposedly learning wilderness survival skills. I learned something different that day. In the wilderness, we can learn that Heavenly Father's "natural" creations are magnificent and beautiful, to a degree that is beyond the attainment or grasp of mankind's most sublime creations. Nothing we can do is even close. Within the walls of Happy Canyon, Walt Disney engineers would weep with envy at the lighting effects alone. But the sheer scale of the canyon, this tiny scratch on a topo map, is simply staggering to experience in the body, as you slither ans bound through the sand from boulder to boulder. As you descend from the top, the canyon walls close off all view of the sky, and reflected light glows pink or red or yellow or orange, depending on how it is being filtered down. As you descend lower, the walls grow narrow, in places close enough to touch both sides at once. Amazing. 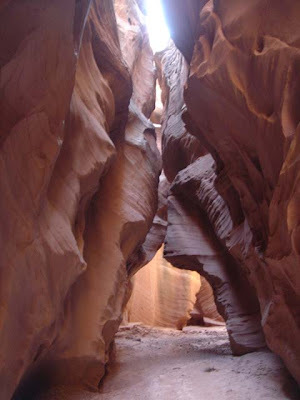 Some trick of water and gradual erosion patiently wore the sandstone away, leave this unique slot canyon. Who needs an explanation? It is a miracle of the Creator -- one of so many things that testify of Him. This is my kind of lesson. Sometimes I forget to learn about the history, I get so caught up in the beauty and the awesomeness of the moment.